Kapuso couple Mikael Daez and Megan Young took to Twitter who their bet is for the role of the next 'Darna'. Their choice... no other than Ultimate Star Jennylyn Mercado! 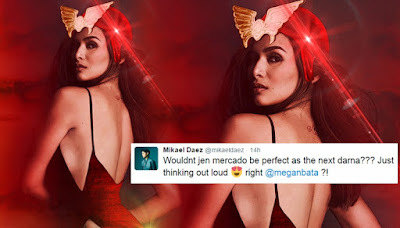 Mikael says his former My Faithful Husband co-star Jennylyn Mercado is just perfect to play the Pinay Super Heroine to which his girlfriend Megan agreed to. Jennylyn may be a Kapuso but who knows! She was able to cross the border last year when she starred in the Star Cinema box office romantic comedy film Just The 3 Of Us opposite Romance Royalty, John Lloyd Cruz. Jennylyn is set to do a film with 'Darna' Director Erik Matti this year under Reality Entertainment. However, no details about the film have been released yet. Check out Mikael and Megan's conversation below.